Despite international protection, big-leaf mahogany is still being plundered at an unsustainable rate. The levels of illegal logging and the lack of implementation of international legal trade requirements are pushing this majestic tropical hardwood tree towards extinction. 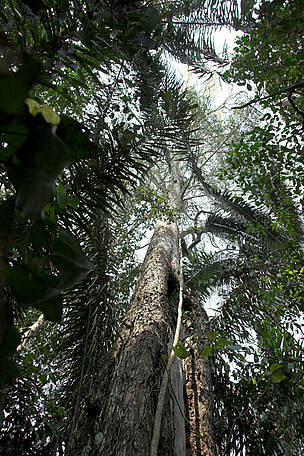 At heights of up to 60 metres, this massive evergreen species bursts out above the ceiling of the forest canopy. It is named after the big leaves that it bears, which can be as long as 50 cm. Its bark is dark-brown and flaky with a sweet odour. Its flowers are small and white in colour but the fruits are large capsules that are light grey to brown in colour. It is one of the most commercially important trees in the Amazon as other members of the mahogany genus are commercially extinct due to overexploitation. Mahogany (known as caoba throughout much of Latin America, as mogno in Brazil, mara in Bolivia, and ahuano in Ecuador) is patchily distributed from southern Mexico through Central and into South America, to its southern limits in Bolivia and Brazil. The trade in big-leaf mahogany began with the Spanish in the 1500s and over the centuries the mahogany populations in Central and South America have gradually declined. Big-leaf mahogany – prized for its rich reddish colour and good technical characteristics – has been sought, traded and used for the manufacture of furniture, musical instruments and other wood products of high quality, beauty and durability. The big-leaf mahogany forests are an important habitat for many species including the endangered giant otter (Pteronura brasiliensis). The giant otter lives in the streams, rivers, lakes and wetlands of the Amazon and other South American river systems. The removal of big-leaf mahoganies and other trees leads to soil erosion which destroys the river habitat of the otters. Big leaf mahogany (Swietenia macrophylla), Peru. 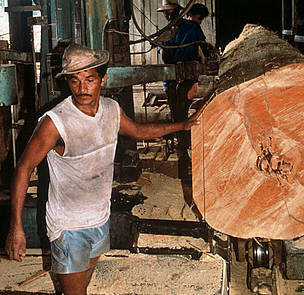 Big-leaf mahogany's range includes the Amazon, which is a WWF global priority region. Big-leaf mahogany are a priority species. WWF treats priority species as one of the most ecologically, economically and/or culturally important species on our planet. And so we are working to ensure such species can live and thrive in their natural habitats. While information on mahogany inventories and status is incomplete, there is evidence of sharp population declines and increased fragmentation. Population reductions in Central America are estimated at over 70% since 1950 and the species is reported to be commercially extinct in El Salvador, Costa Rica and in parts of South America such as Mato Grosso in Brazil, and Beni in Bolivia. Besides forest conversion for other land uses such as agriculture, illegal logging and unregulated trade pose major threats to populations of this species, potentially exhausting commercial supplies of this valuable timber in the future. Deforestation has reduced big-leaf mahogany ranges by over 60% in Central America and by 30% in South America. Natural forests have been the prime target for the exploitation of mahogany because long-term efforts to grow the species in plantations have been mostly unsuccessful. Mahogany tree trunk being sawn into planks. There are 600 sawmills in the municipality, which cut up to some 5000 trees every day. The labourers, including children, live and work in appalling conditions for subsistence wages. Paragominas, Amazonas, Brazil. Investment in forest certification and promotion of the Forest Stewardship Council. Driving improvements in forest managment and trade practices to reduce inefficiencies and offer financial incentives for the sustainable management of natural forest. WWF is attempting to shape the market through its Global Forest & Trade Network (GFTN). Action to address the problem of illegal logging, including work with government and regulatory authorities to ensure quotas are not exceeded and proper monitoring controls are in place. WWF has worked with governments and local communities for over 40 years to protect and conserve the Amazon rainforest. Check before you buy - always look for FSC certification when purchasing wood products. The fruits of bigleaf mahogany are called sky fruit, because they seem to hang upwards from the tree. Each fruit contains 71 winged seeds, 7 to 12 cm long.